HelpHound Blog: Using a reviews site? Keep an eye on Yelp! Not so much the stock market perhaps? How so? 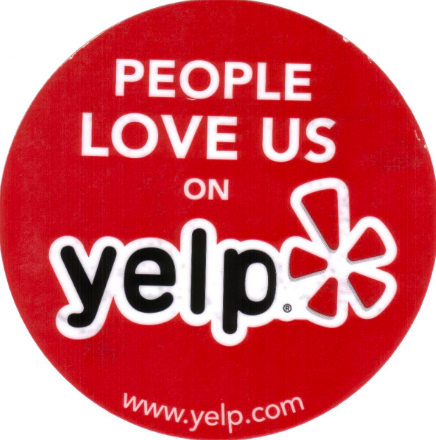 Yelp - as Yelp Inc. - is the largest quoted reviews site on the planet, and we would argue that its share price is a pretty effective barometer of the value of all review sites. And by value, we mean value to paying businesses as well as to consumers. ...showing Yelp's share price from its peak in 2014 (March 7 2014, to be exact, at a price of $97.25). That's a fall of over two thirds of Yelp's market value. Why? Let's examine what we at HelpHound, as interested observers, think about Yelp. First of all we think Yelp is a victim of very bad business luck. The same 'bad luck' that put paid to businesses like Nokia - a bigger competitor came along, in Yelp's case that competitor was their worst nightmare: Google. 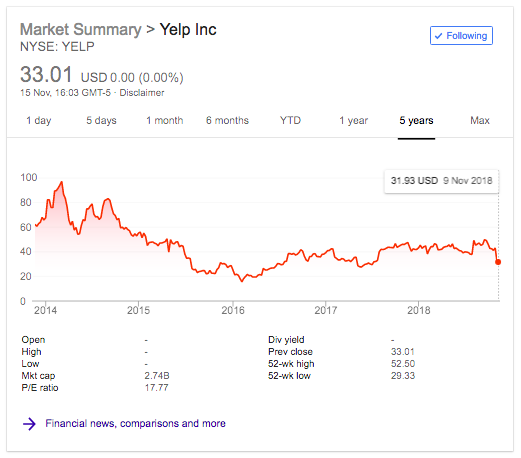 Yelp management may have hoped that they would be able to dominate the reviews space, at least for some years, but that was not to be, it's Google all the way now. What's to learn for those businesses using other review sites? You're with Trustpilot or Feefo? Neither of those businesses is quoted on any stock market, and, with the recent performance of Yelp frightening off investors, is unlikely to be any time soon. But that doesn't prevent customers of those businesses learning lessons from Yelp's share price performance. The lessons? *Legally: far too many businesses have taken 'lesson 1' on board and focussed all their efforts on getting great Google reviews, but they have broken the law in doing so (and continue to do so). They have 'cherry-picked' happy customers to write reviews.